Earlier this summer, Jamie McLeod-Skinner announced her plan to become Oregon’s next U.S. Representative, a seat held for 18 years by conservative Greg Walden. An Ashland high graduate, McLeod-Skinner returned back to her home turf after far-flung work experiences in Bosnia and Kosovo in the late 90s, and then working in the city government in Santa Clara from 2003 until 2012. She continued her governmental work, being hired last November of the City Manager for Phoenix, Oregon, but was dismissed four months later (which she addresses in her answers below). 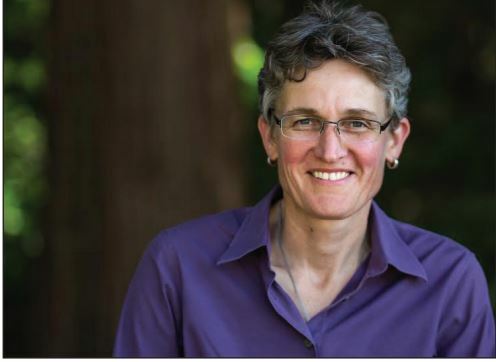 Shortly after her dismissal, she announced a bid for the Democratic candidate for Second Congressional District of Oregon, a massive geographic area that covers nearly two-thirds of the state, reaching north to south from Hood River to Ashland, and east from the Cascades. It is also a seat that Rep. Walden will have held for 20 years by the time elections roll around next November. The Messenger recently caught up with the hopeful candidate. RVM: The Second District is remarkably large. How do you balance all of the different interests? And/or, is there a common theme that connects this geographic area? JMS: Oregon’s second congressional district is not only large, it’s culturally diverse with a mix of urban and rural, liberal and conservative, with recent arrivals and those whose family history dates back to prior to Oregon being a state or the US being a country. Despite those differences, we are united by Oregon Values—a commitment to family, a care for community, and an independent nature. Ultimately, everyone wants clean water, clean air, and the ability to provide for their families. The common themes I’m hearing across the district are: good paying jobs, universal access to affordable health care, and sustainable use of our natural resources. RVM: Is this too big of a district? JMS: The size of the district makes it challenging. In the past two months, I’ve driven over 5,000 miles to meet voters in the places where they live and work to develop relationships and hear about their challenges and aspirations for their futures. But in another sense, we represent our country in many ways: we’re a mix of urban and rural, red and blue, and everything in between. I love that about our district. And while our nation is mired in political bickering, communities around our district are working together to overcome local challenges. From the Klamath Basin Restoration Agreement to the Sage Grouse Solution, Oregonians have shown that we come together—from across the political divide—to solve problems. Unfortunately, that great work has not been supported by our congressional representative. I am committed to supporting local solutions that meet overall goals. In this regard, our size and diversity have been our strengths. RVM: I understand that you are conducting listening sessions. Is there a common theme you are hearing? JMS: People want good paying jobs, affordable universal health care, and protection of our environment/sustainable management of our natural resources. People have been excited by my proposals to promote renewable energy and healthcare as part of our social infrastructure. Folks are angry at Walden, especially in rural areas, for his proposal to gut our access to health care in order to give tax breaks to his millionaire donors. People are also sick of political bickering. I’ve received a lot of positive feedback from folks–-especially those with different political affiliations—who appreciate being listened to and heard. RVM: If elected, what would you like your legacy to be? Is there a specific law or policy you would want to implement if you could only do one? JMS: I’d like my legacy to be that I consistently supported people over politics, that I worked hard for the best ideas to care for my constituents, regardless of who proposed them or received credit. That has been the legacy of Oregon’s greatest leaders, regardless of party affiliation, and I would be honored to join their ranks. I’d especially like to be considered a champion for rural communities and progressive ideas, because that’s who I believe has been overlooked and currently need the most support. RVM: You are standing against dismantling current health care policies. Is this the same as standing for the current health care policies? JMS: The Affordable Care Act (ACA) was an important first step, but we need to go further to meet the needs of people throughout our state. In my conversations with voters throughout our district, I find that buzz words get in the way of being able to discuss ideas. People tend to have a knee-jerk response that often aligns with party affiliation: some people love the ACA but hate Obamacare. But when we talk about ideas—everyone having access to affordable healthcare coverage—there is consistent agreement. I’ve been using more general terms to describe my support for a baseline of mental and physical health care services, and describing it as part of our social infrastructure, just like our public school system. RVM: Have you had any interactions with Rep. Walden? JMS: Not directly, though I attended his town hall in Medford where he told us that he would not support taking away coverage for pre-existing conditions. The next week he returned to Washington DC where his health care proposal removed coverage for pre-existing conditions. I’ve spoken to people who generally support him that considered his about-turn to demonstrate a lack of honesty and integrity. RVM: Are you worried that your opponent will use your short tenure at Talent City Manager against you? JM:S If he feels challenged, he will attack me. So I look forward to that because I aim to challenge him. My entire career I have maintain a well-earned reputation for integrity and respect for my fiduciary responsibilities. That was part of the reason I was given for my hire as Phoenix City Manager: I was asked to help rebuild the city’s reputation. Shortly after I was hired, there was an election that brought in a new leader with different priorities. Sally Yates faced a similar dilemma under a new administration. I am and remain committed to integrity and ethics in public service, regardless of whether I’m attacked or fired for it. I think we need more of it in our representatives, and that’s part of the reason why I’m running. RVM: After last November elections there was a lot of chatter that “rural communities” and “progressive values” are diametrically opposed. But you based the philosophy of your campaign on bringing those two together. What gives you faith that these two “ideas” fit together? JMS: Because people love their families and care about their communities. Farming and ranching jobs can be dangerous work, and many rural areas did not have sufficient access to healthcare prior to the ACA. People take great pride in family heritage, and your kids can’t continue to farm or ranch if the water is used up or the land is not sustainably managed. I’ve met self-proclaimed religious conservatives who are 100 percent committed to ensuring that their grandkids have clean air and water. And every family has a gay or lesbian member – they may not label them as such, but they’re family. These progressive concepts are embedded in rural life. Political punditry sells people short by simplifying us. But I admire the commitment to family and the often stubborn pride that is common in rural areas. Rural folks balance being very independent-natured with an appreciation of our interdependence. If you get a flat tire in an urban area in the middle of winter, you can call a tow truck or walk for help. But if you’re in a remote area, and don’t have cell coverage, having a complete stranger pull over and help could mean the difference between survival or freezing to death. Rural folks get that in a way most urban folks don’t. RVM: You are a horse person, and you say your mom still makes you muck the stables. Is there a lesson from taking care of horses that applying to be successful in Washington DC? Absolutely! By working hard to remove the horse manure from the clean bedding, you create a safe and healthy environment for constituents to flourish. Phil Busse has spent the past 20 years as a journalist, attorney and educator—and doing his tour of duty with alt-weeklies. He has served as the Editor for the Source, a popular weekly newspaper in Bend, Oregon and was the founding Managing Editor for the Portland Mercury. While in law school, he wrote crime and legal stories for the Eugene Weekly and started his writing career as the first environmental beat reporter for San Francisco Weekly. In 2006, Phil started the Media Institute for Social Change (MediaMakingChange.org), an educational non-profit. Based in Portland, Oregon, the organization hosts college students each summer to teach them how to produce public interest film and radio documentaries—and, in 2013, helped launch XRAY.FM, a talk and music radio station that won Willamette Week’s readers choice for Best Local Radio Station in 2015. Phil is truly surprised that he ended up as a newspaperman; as a kid, he believed that he would grow up to be a spy, and has spent a lifetime acquiring the proper skills—he is certified SCUBA diver, knows how to tie a bow tie and can mix (shake) a mean martini. Phil graduated from Middlebury College in 1992 and earned his law degree from the University of Oregon in 1997. Great interview with Jamie McLeod-Skinner. Thanks! Jamie McLeod-Skinner will be a breath of fresh air to the political process. Thank you for the insight in to McLeod-Skinner’s thoughts and philosophy. Phil-How do we know you are not a spy and being a newspaperman isn’t your cover😉. Jamie McLeod Skinner has a great background for our U.S Represntive. She LISTENS AND WILL ACT TO help people in the 2nd District. People will be surprised how much she cares for people and works hard to solve problems. This quote was taken from the Bay Area Reporter regarding Jamie McLeod Skinner’s run for Oregon’s 2nd Congressional District seat. ***Jamie McLeod-Skinner was fired from her position as Phoenix, OR city manager due to her mistreatment of co-workers.There is a letter from a city council member I can share. *** “It’s time to clear up this nonsense about Jamie McLeod-Skinner being part of our ranch family. She’s a California liberal who came out to the ranch a few months back and got a selfie under our sign,” Bob Skinner is quoted as saying. “Her wife may share our last name, but they’re distant. Skinner asked McLeod-Skinner to stop using his ranch sign in her campaign. *** From my understanding this will be the first time Jamie will vote in this district. Understands area needs? Jamie McLeod-Skinner is not the rural democrat she is “pitching” herself to be. While listening to Jamie talk with a local Ashlander, Jamie presented herself as an Oregon farmer/rancher. She has several ad pictures with livestock in them in order to sell herself as the rancher she is not. Since Jamie was claiming she has ranching ties in Jordan Valley, the person talking with Jamie had asked a question about the horse and cow tripping in Jordan Valley and whether that horrific practice has stopped. Jamie didn’t have an answer. When she walked away she muttered, in a disgruntled tone, something to the effect of, ‘You people from Ashland are sure cupcakes about your animals.’ By the way, yes I am! Jamie McLeod-Skinner is NOT for Oregon. Before voting it’s important to understand the “truth” and not just follow the herd. This is a letter from a City Council Member in Phoenix. He was born and raised in Oregon, and was there when Jamie McLeod Skinner was fired from her city manager position.